Brief Synopsis: Booster Gold retells his origin. 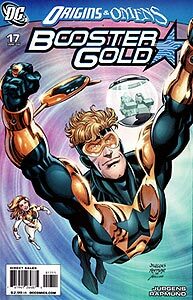 Story Notes: This story, yet another re-telling of the origin of Booster Gold (the 3rd in three years) is credited to Dan Jurgens, the creator of Booster Gold. However, it contains some notable deviations from the previously recorded history of Booster Gold. Whether these are an oversight by Booster's creator or part of the new DC Universe in the wake of the recent events of Final Crisis remains unclear. POWER DOWN: Booster complains to Skeets II that his "suit" is sluggish. This must be a reference to the reaction time provided by the suit in response to Booster's actions since no version of his current power suit (a redesign of his original Mark I power suit) has ever been responsible for the speed of any type of locomotion. Booster's flight power is granted by the Legion of Super-Heroes Flight Ring that Booster wears prominently on the middle finger of his his left hand. POWER UP: Booster passes the time during a power suit tune-up by Rip Hunter by retelling his origin. As Booster begins narrating his origin story, the panel depicts his father. This is actually the first time that his father has appeared visually in the telling of Booster's origin. SCHOOL'S OUT: As Rip Hunter and Michelle Carter stand before a blank (!) chalkboard, Booster claims that he did not know that the Time Sphere that he stole from the Space Museum belonged to Hunter. However, the original origin story as seen in Booster Gold, Vol. 1, #7, clearly shows the Time Sphere, which was at the time even labeled as "Rip Hunter's Time Machine." 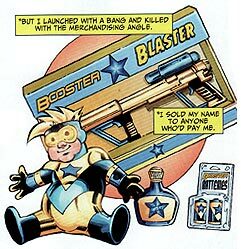 PRODUCT PLACEMENT: Products that Booster appear to have endorsed include a Booster Blaster water gun, D-cell Booster Batteries, a Booster Gold doll, and an unlabeled bottle of Dusk cologne. Michelle Carter has never actually taken the name Goldstar, and so far as this chronicle of the history of Booster Gold is aware, has never been called such. While she did don the magnet-powered suit in Booster Gold, Vol. 1, #20, it was not to fight crime but rather to enjoy the sensation of flight. Booster's comment, "if things go sour, I can always turn to Bats," referring to Batman, is ironic (no doubt intentionally so) in the wake of the conclusion to the recent events of Final Crisis.